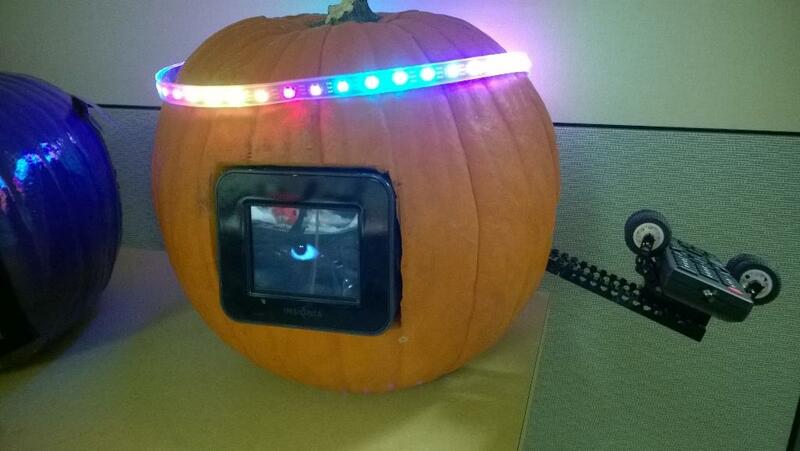 Probably not great as a long-term storage device, but my co-worker and I just decorated up a Infocast 3 using my new Creepy Eye widget as part of a haunted carved pumpkin for our Roku Austin Halloween party. The arm is a Lego Mindstorms creation moving a remote control, the LED strip is a BlinkyTape (http://blinkinlabs.com/blinkytape/), a project fellow a NYC Resistor member launched last year on KickStarter. On Halloween, I typically stack up a half-dozen or so different types of chumbys in the window near the front door. and put the Eyeball widget on all of them. Very creepy. Note that tapping that widget switches between left and right eyes. Here's another cool eyeball widget, reacts when pressed. You should make your eyeball widget public. There are a couple of Halloween themed widgets - I like Yuzzy's Halloween Clock. Ah, it was public briefly, then I saw a problem with it (described in the programming forum) so made it private while I worked on the SWF file. I forgot to flip the public switch back. Done!